Once more onto the grill. We created a flavorful marinade with pureed jalapeños, garlic, cumin, and cayenne to give our shrimp skewers a spicy, assertive kick, and then set some aside to double as a sauce. Butterflying the shrimp before marinating and grilling them opened up more shrimp flesh for the marinade and finishing sauce to flavor. We also packed the shrimp very tightly onto the skewers so they would cook more slowly. • For a charcoal grill: Open bottom vent completely. Light large chimney starter filled with charcoal briquettes (6 quarts). When top coals are partially covered with ash, pour evenly over half of grill. Set cooking grate in place, cover, and open lid vent completely. Heat grill until hot, about 5 minutes. • For a gas grill: Turn all burners to high, cover, and heat grill until hot, about 15 minutes. Leave all burners on high. Thread marinated shrimp onto four 14-inch metal skewers. (Alternate direction of each shrimp as you pack them tightly on skewer to allow about a dozen shrimp to fit snugly on each skewer.) Sprinkle 1 side of skewered shrimp with sugar. Place shrimp skewers sugared side down on hotter side of grill (covered if using gas) and cook until lightly charred, 3 to 4 minutes. 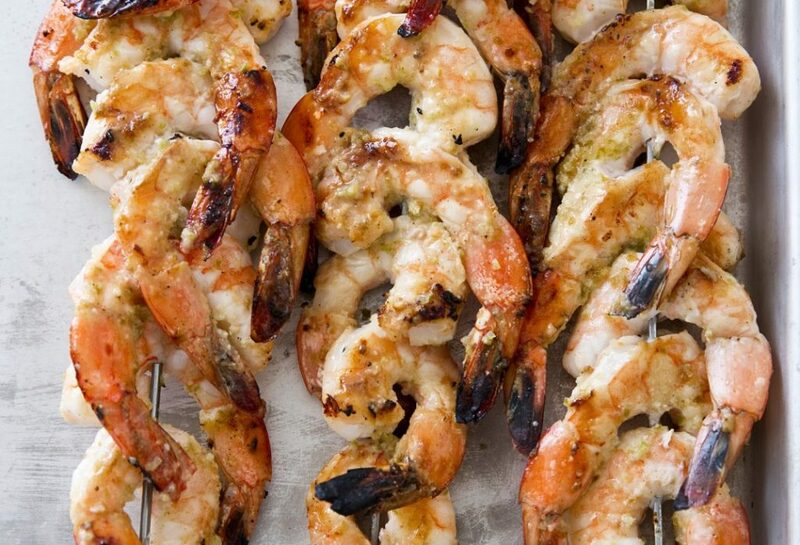 Flip skewers and move to cooler side of grill (if using charcoal) or turn all burners off (if using gas) and cook, covered, until other side of shrimp is no longer translucent, 1 to 2 minutes. Using tongs, slide shrimp into clean bowl and toss with reserved marinade. Sprinkle with cilantro and serve.